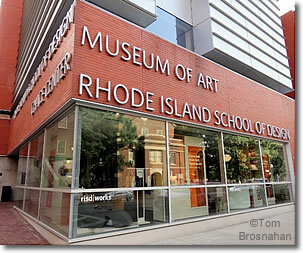 The Rhode Island School of Design's Museum of Art is Providence's finest, and one of the best small New England art museums. 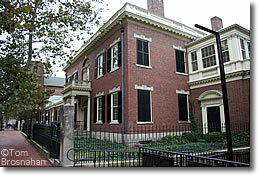 The Museum of Art of the Rhode Island School of Design on Benefit Street (map) in Providence RI holds about 100,000 works of art from Europe, the Americas, ancient Greece and Rome, China and Japan. European, American and Latin American artists include George Wesley Bellows, Georges Braque, Mary Cassatt, Paul Cézanne, William Merritt Chase, Thomas Cole, John Singleton Copley, Edgar Degas, Roberto Matta Echuarren, Hendrick Goltzius, Martin Johnson Heade, Robert Henri, Winslow Homer, Angelica Kauffmann, Oskar Kokoschka, Wifredo Lam, Fernand Léger, Edouard Manet, Henri Matisse, Claude Monet, Lippo Memmi, Georgia O’Keeffe, Maxfield Parrish, Nicolas Poussin, Pablo Picasso, Nancy Elizabeth Prophet, Joshua Reynolds, Tilman Riemenschneider, Auguste Rodin, Salomon van Ruysdael, John Singer Sargent, Charles Sheeler, Gilbert Stuart, Giovanni Battista Tiepolo, Joaquín Torres-Garcia, and others. There's a good collection of American painting, furniture, costumes, and modern works of art, as well as a collection of more than 86,000 works from Greece and Rome, China and Japan. Of the choicest pieces in this impressive collection, Rodin's famous statue of Balzac ranks high, as does Monet's Bassin d'Argenteuil and the collection of Townsend/Goddard furniture in Pendleton House, the museum's "American wing." For current exhibits, see the RISD Museum website. The Benefit Street entrance of the Rhode Island School of Design's excellent Museum of Art on College Hill in Providence RI.